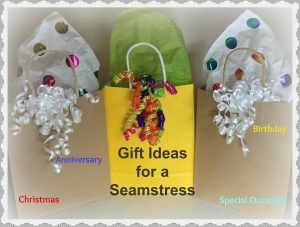 Looking to practice your sewing skills and make a fun sewing project? You are in the right place! 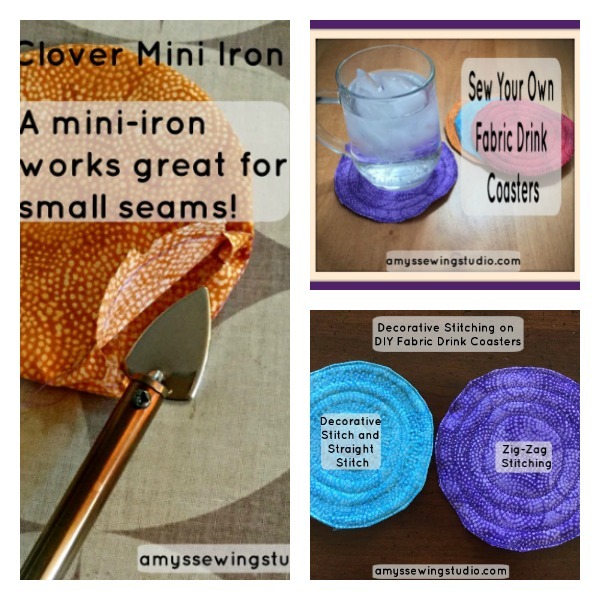 You will learn how to sew with circles, clip curved seam allowances, learn how to do some simple quilting AND end up with some awesome fabric drink coasters! Fabric– For 4 coasters of same fabric front and back (approx. 10″ X 20″ piece) You can find some fabrics like I have that have the same pattern but come in different colors or if you have fabric scraps- use those! Cotton Batting – 10″ X 20″ piece for 4 coasters or 4 1/2″ square for one coaster. Paper (Cardstock for the making a template and regular printer or tissue paper for sewing-you’ll see later what I’m talking about 😉 ) You may just prefer to purchase a plastic circle template. Now that you have all the materials, the first thing you’ll do is make a template. Ready? Let’s do this! Draw your own circle shape template on a heavy weight paper if you have some; otherwise regular paper will work too. Using a compass, cookie cutter or other circular item, trace around your item on the paper. You’ll want to make TWO templates. 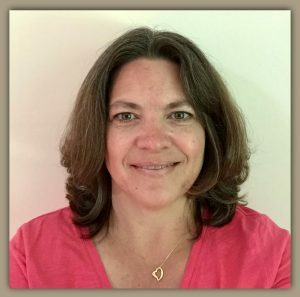 One being 4″ in diameter and the other being 4 1/2″ in diameter. I used a 4” round cookie cutter, traced around it on a piece of paper and then used a ruler and added 1/2” seam allowance to the whole circle shape. The 4″ template will be used for cutting out the cotton batting pieces for the drink coasters. The 4 1/2″ template will be used to cut out the fabric pieces for drink coasters. Use the 4″ template to place on the batting, trace around the template with a pen and then cut out your circles. 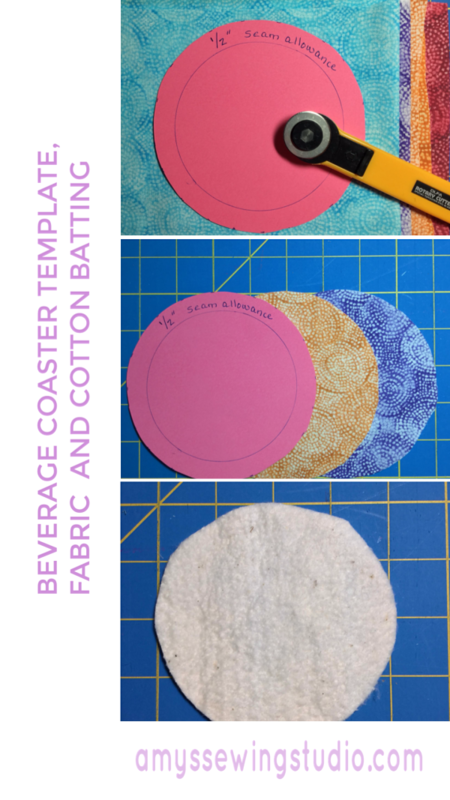 Use one piece of batting for each fabric drink coaster that you’ll make. You’ll start out making sure you have two layers of fabric having right sides together. 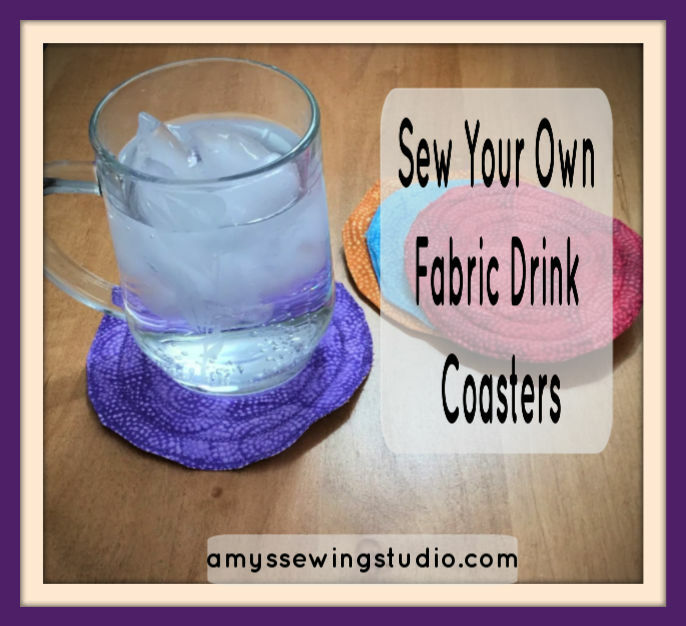 To make this sewing tutorial easy, I used the same fabric for the front and back of the beverage coaster. You can use two different fabrics and you’ll then have reversible fabric coasters-you choose! With fabrics right side together, (if you have a 10″ X 20″ piece of fabric like mentioned above-fold fabric in half right sides together and now your fabric piece will be 5″ X 20″) use the 4 1/2″ template you made, trace circle shape on the side of fabric facing you. 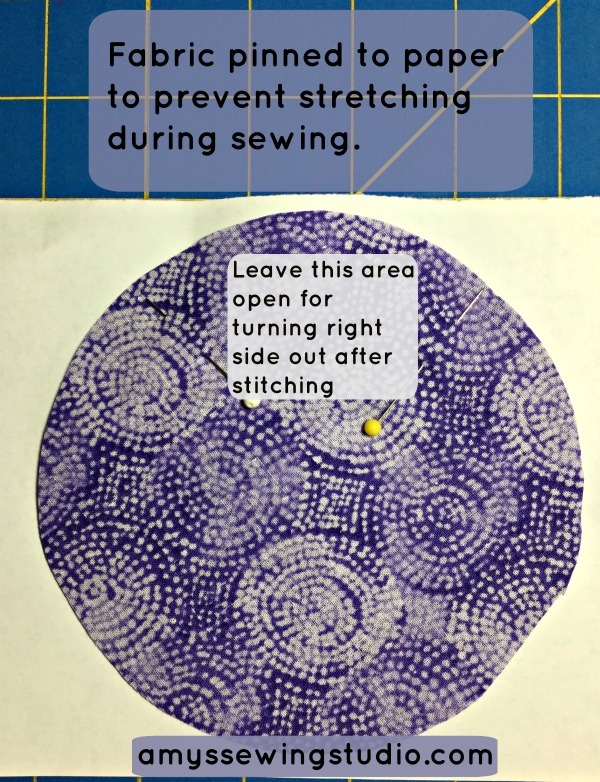 After your circles are drawn on the fabric, PIN the layers of fabrics BEFORE cutting. Baste 3/8” from raw edge on each round piece of fabric where you will leave open to turn your coasters. 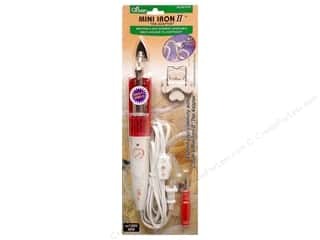 You could also use a marking pencil and make lines. (see photo below). 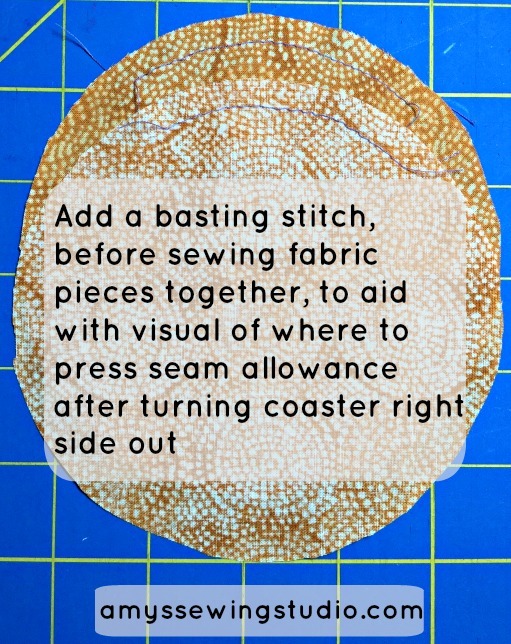 The basting or marked lines will give you a visual of where to press your seam allowance to the inside after you turn the coasters right side out. TIP for stitching these round coasters— USE A piece of paper under the fabric when stitching. 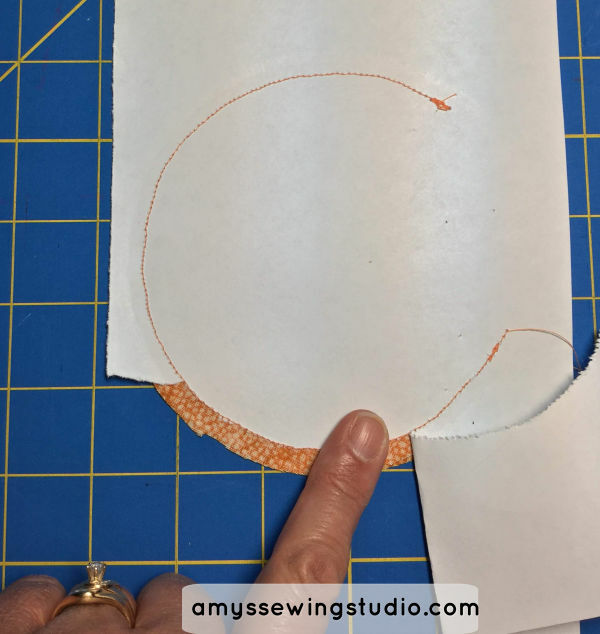 (Paper layer underneath fabric layers- paper layer will be on the sewing machine and fabric layers on top) This will help to keep the fabric from stretching out as you are stitching in a circle. I took several different photos as I was working on these coasters; hence the different colored fabrics 🙂 NOTE: In the orange coaster photo you see the baste stitches in the area where you will be turning coasters inside out. 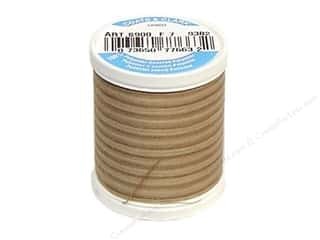 It’s not the end of the world if you don’t use paper but you’ll notice that your circles will be bit stretched out of shape; that is because with a circle shape, part of the fabric will be on the width and length grain lines, and part of the fabric will be on the bias grain. The bias is where you notice the fabric stretching a bit while stitching. 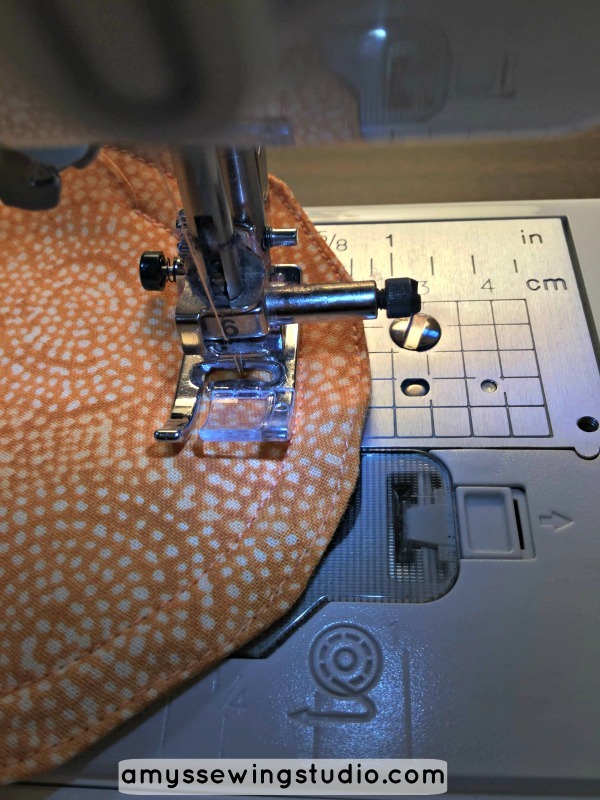 With right sides of fabric together, stitch a 3/8” seam. Make sure to backstitch when starting this stitching and when ending as well so the stitching stays together while turning fabric. ( NOTE: I had you actually draw a 1/2” seam allowance and you are ONLY stitching 3/8″, the extra 1/8” will give extra room inside the coaster for adding the cotton batting. 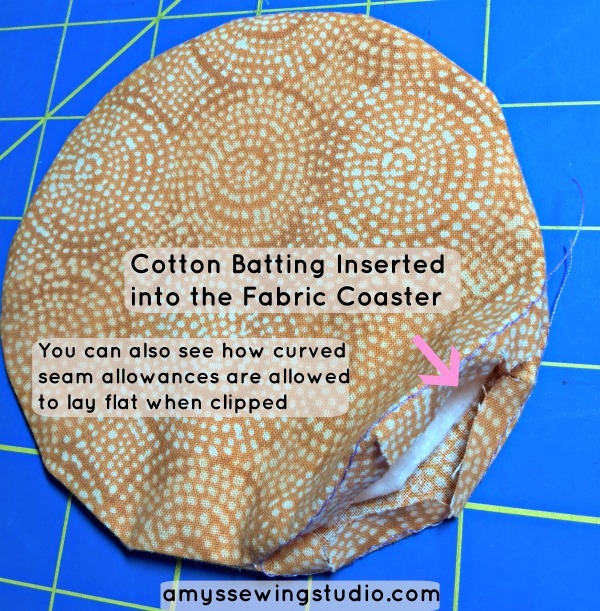 REMEMBER TO LEAVE an opening for turning the fabric coasters right side out. The basting step above can be your reminder to NOT stitch where the basting is. 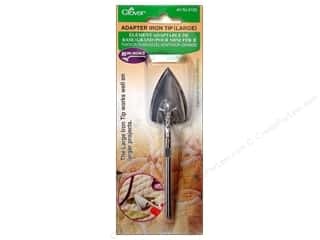 Clip seam allowance edges BEFORE turning right side out. Why? When you turn curved edges to the inside of a project, the fabric will NOT lay flat until you clip the seam allowances. 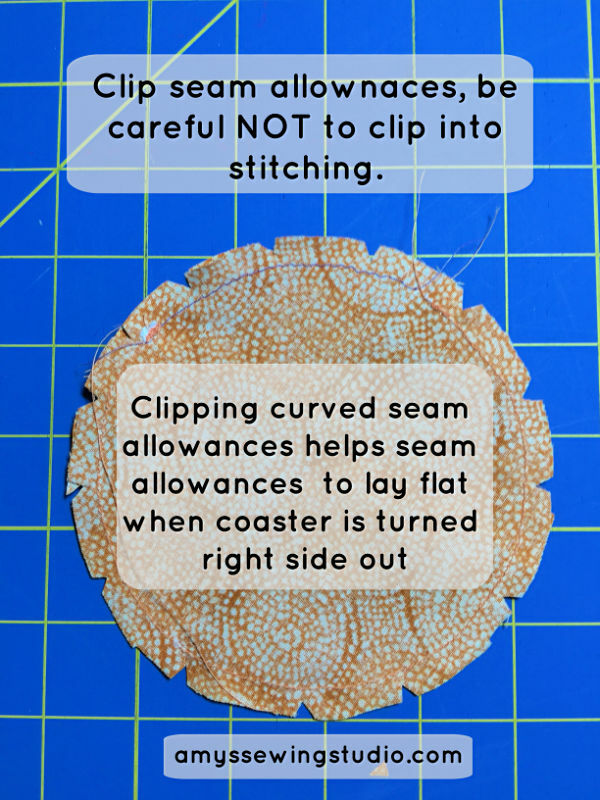 Turn coaster right side out- use your finger to help press out the seams before you actually iron them. Insert the cotton batting into the coaster. Flatten out the batting and making sure it is centered within the coaster. 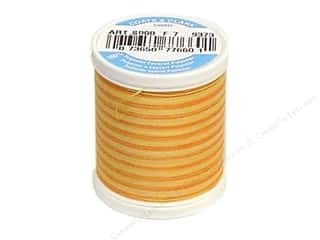 If you used a basting stitch as your visual line for ironing, go ahead and take the basting threads out of the fabric. Match up unstitched seams the best you can, use a few pins to help keep seams together until you stitch. 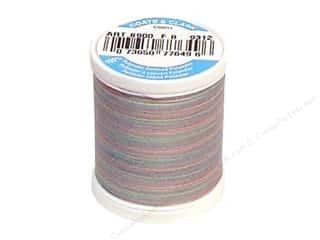 You can use thread that matches your fabric or you can choose a different color thread that makes your stitching stand out and give your coasters just an extra bit of personality! 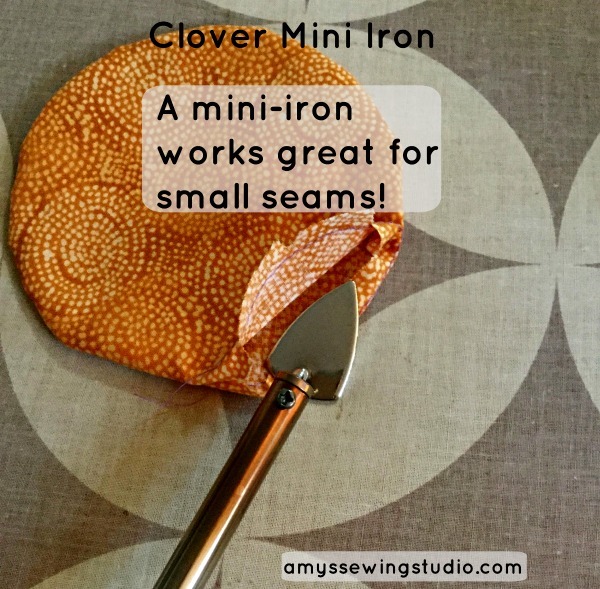 For this tutorial I chose thread that matched the fabric. Now’s the time for the finishing touches on your coaster. 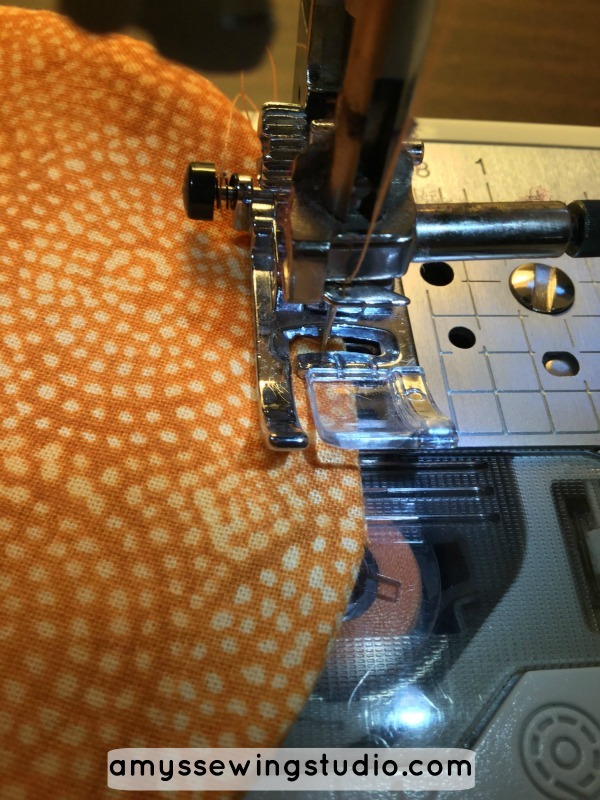 You need to do some extra stitching (quilting) to hold the cotton batting in place. 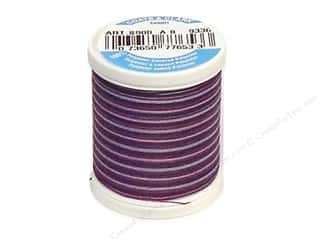 You can choose to sew a circular design like I did; regular stitching using the edge of the sewing machine foot as your guide. Just keep stitching circles until you feel like there is no more space to sew. 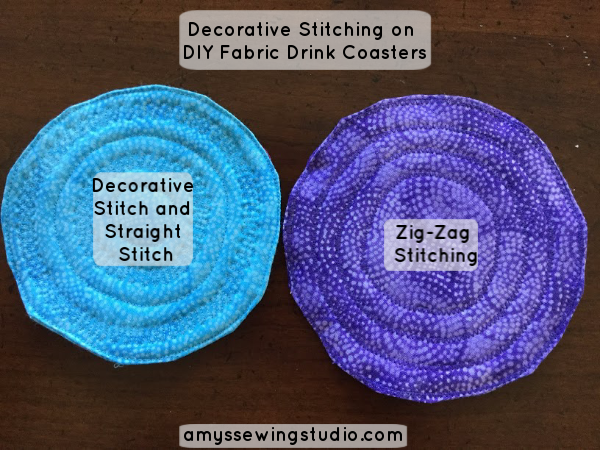 You can choose your finishing stitch on your coasters! One of my coasters I used a decorative stitch just to see what it looked like-pretty cool! 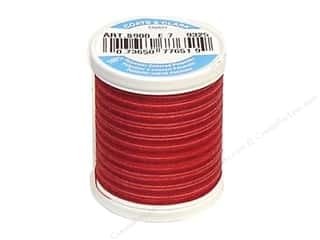 I can only imagine what a decorative stitch looks like with a different color of thread! 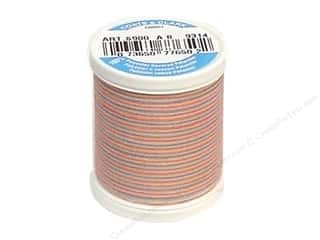 Have you heard of variegated thread-If not, today is your LUCKY day! 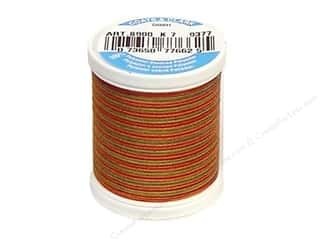 Variegated Thread is multi-color thread! 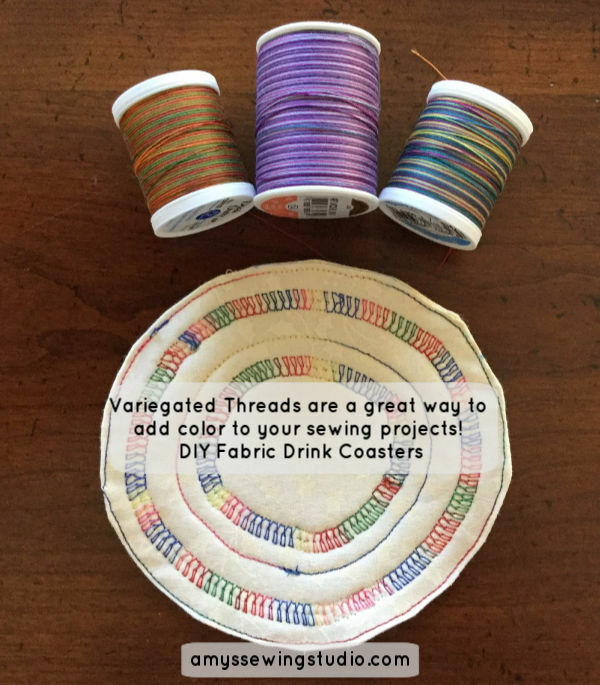 What a great way to add extra color to beginner sewing projects and these round cotton fabric drink coasters would be the perfect place to try using this kind of thread! 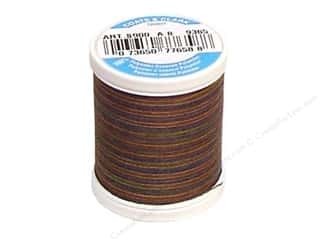 The GREAT thing is that this multi-color thread is ALSO ‘All-Purpose’!! You just sewn some AWESOME Fabric drink coasters for your home or to give as a gift! 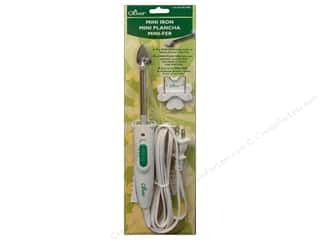 As a beginner seamstress, you may have also learned how to clip fabric for curved seam allowances. NOTE: I don’t suggest putting these drink coasters in the dryer. I stuck mine in the dryer and they got sucked into the lint vent area, YIKES! Just let them air dry. P.S. 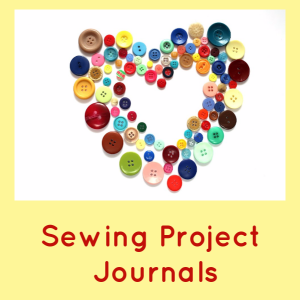 Make sure to TAKE A PICTURE of each of your finished sewing projects and keep them in a Projects Journal! Pin this Collage to your favorite Pinterest Board!